Results: Graphene, a single layer of carbon atoms, is an attractive electrode material for supercapacitor applications because of its high surface area. However, how the electrolytes interact with carbon material to store energy is still not well understood. 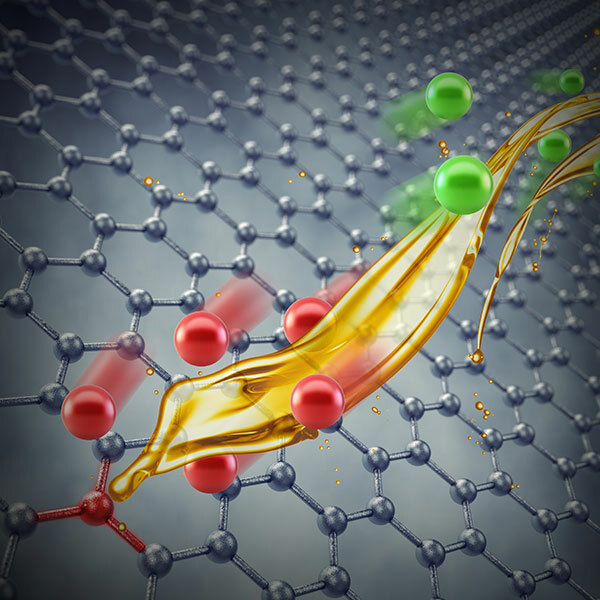 Scientists at Pacific Northwest National Laboratory (PNNL) and Princeton University investigated how the surface chemistry of graphene affects the charge storage mechanism. They found that the defects on the graphene surface alter the liquid's interaction with the surface. The ionic liquid's cations, i.e., positive ions, aggregate near a defect, and the anions or negative ions are repelled by it, altering the molecular arrangement of the ionic liquid on the surface. "Identifying how the charged ionic species bind to the electrode surface is very important for increasing the storage capacity and improving the charge-discharge kinetics for energy storage devices," said Dr. M. Vijayakumar, who led the research. Why It Matters: Traditional supercapacitors are made of high surface area carbon. However, graphene potentially has the highest surface area among carbon materials and, thus, could significantly increase the specific capacity. However, it is difficult to understand and control how the charged ionic species are incorporated and transported in the graphene electrodes. The team's research provides fundamental insights into the molecular structures built when graphene has functional groups or defects that interact with the electrolyte. The study provides scientists with a basic understanding to create better materials for energy storage. "The problem is most studies are based on the assumption that defect-free graphene is used, which is not realistic and distorts the interpretation of the research results," said Dr. Birgit Schwenzer, a materials scientist who worked on the study. "We wanted to know what influence the defects would have on the graphene interactions with electrolytes." Methods: The researchers mixed exfoliated graphene with the ionic liquid. Unlike other electrolytes, the ionic liquid contains bulky organic negatively and positively charged ions. In this case, the cation was 1-butyl-3-methyl-imidazolium (BMIM+), and the anion was trifluoromethanesulfonate (TfO-). A thin layer of ionic liquid formed around the graphene flakes. The team analyzed the thin layer using 11.7 Tesla magnetic field magic angle spinning nuclear magnetic resonance spectrometer, X-ray photoelectron spectroscopy at EMSL and Fourier-transform infrared spectroscopy in the Physical Sciences Laboratory at PNNL. They correlated the spectra with computational models of the interaction between an ionic liquid molecule and graphene with a single defect or functional group, such as a hydroxyl group, which is an oxygen atom and a hydrogen atom, attached to the surface. The models were built using density functional theory with empirical dispersion correction based methods. "We would like to emphasize that the model considers just one hydroxyl group," said Vijayakumar. "More detailed theoretical studies with more functional groups are ongoing, which will give us a deeper understanding of the interfacial region." The team found that functional groups on the surface change the molecular arrangement of the liquid's cations and anions. For example, the cations are more likely to be absorbed near the oxygen-containing functional groups, because of the relatively higher attraction of the ionic liquid's positively charged cation to the negatively charged oxygen in the hydroxyl group. Further, the negatively charged defects repel the TfO- anions. Both the cations and anions exhibit a variety of molecular orientations near the functional groups on the graphene surface, far different than their perfect arrangement on defect-free material. What's Next? This study is a proof of principle, showing how graphene with defects and ionic liquid interactions can be studied. Now, they are looking to extend their research to different molecular models able to handle more defects on the graphene surface and other complexities. Electrochemical supercapacitors store energy in the electrical double layer and can rapidly release the stored energy. Supercapacitors are used in a variety of applications, such as digital camera flashes, portable speakers, defibrillators, and emergency control systems. Just as with a conventional battery, a supercapacitor has a positive and a negative electrode, but here both electrodes are composed of graphene to gain maximum benefit from its high surface area. Electrons flow from one electrode to the other and in-between are available to do work, providing power to electronic and mechanical devices.